Corporate Sailing is the solely distributor of the Tom 28 Max, a boat designed specifically for match racing and one-design fleet regattas, as well as group activities and formation of sailors at all levels. Its shape resembles an America's Cup boat, with a T-bulb deep keel offering great stability and good performance. Huge space on the working deck as it lacks of interior accomodation, deck systems are both technical and versatile for different level of crews. It is built at K de Komposites yard in Malaga (Spain) by the best experts in racing boats, using the Vaccuum Infusion Method for Resin, which is a guarantee for strength, durability, lightness and compliance of tight one-design rules. Basic systems and parts are build by the most renowned manufacturers: keel on Irons Brothers (UK); steering system on Jeffa (Denmark); mast on Z-Spars (UK); deck hardware on Harken (USA). Currently there are active fleets in Spain and USA. 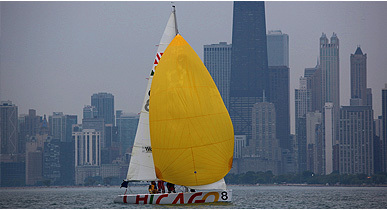 It is the official boat of Chicago Match Race Center (USA) and Valencia Match Race Academy (Spain). The Tom 28 Max has been used as training boat for some America´s Cup teams. Why choosing and sail a TOM 28 MAX?  Suitable for road transport on standard trailers.  Occupies little trolley space on shore.  Ideal for Sailing Schools and beginners' practices.  Permits comfortable crew movements for manoeuvres.  Secure and fast manoeuvres at the bow.  Allows for big groups on board. 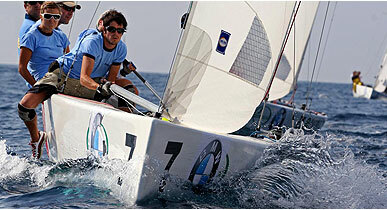  Equals performance at match-racing regattas.  Optimises performance features for manoeuvres.  Makes agile manoeuvring possible. more than 30% on similar size boats. of the boat and its trimming tricks. 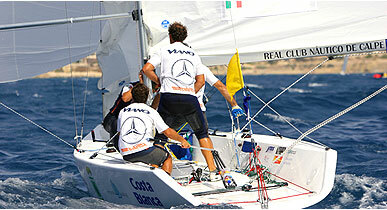  Offers great equality in performance at regattas where boats are provided by the organisation.  Affordable and gratifying for less experienced crews.  A noble sailer, it gives the feeling of being on a bigger, faster yacht.  Keeps a good balance, responding well to wind gusts.  Fast response on the rudder.  Built with particular care in keeping the same One-Design conditions on each unit.  Vaccum Infusion Process applied for the highest quality standards. transversal reinforced structure, longitudinal screens.  Ready to be launched and sailed.  Simple mast and spar system.  Just one lifting point for easy handling onshore.  Needs less maintenance because of its simplified systems.  Created by Match Racing and One-Design specialists.